Real talk: I have thirteen tabs open right now on my Chrome browser. That probably disqualifies me in most people’s minds as anyone who could offer assistance with organizing web habits for more efficient browsing. But, believe it or not, 13 tabs is quite a significant improvement from where I was at before. For years, I have been one of those habitual tabbers. I would open and pin a tab for everything. Paused videos, newspaper articles, blog posts, funny pictures of cats and/or overused memes…if it was on the web, it was pinned in my browser. I wouldn’t even close them; the same pins could sit there untouched for months. Then one day I would get fed up and start going through them, rediscovering those hidden gems I had forgotten existed. Or, if I was really frustrated, just right-click and closing without ever knowing what I had deemed important enough. I usually reached that point when it was taking minutes at a time to load up my web browser. If I said that I would regularly have two or three dozen tabs open at any given time, most of the people reading this would probably be shocked. But there is a sliver of readers who are scoffing at my amateur status. We can all agree that at least one of these issues can be a problem in modern life for each of us. Thankfully, they are also super easy to fix with a couple of carefully chosen tools. I used to be like that: Clicking a link, discovering that’s something worthwhile or interesting, realizing I don’t have time for that right now, keeping a tab open for when I have time. My own solution to that was setting a new tab the way it has all important links as well as my “to read” list. I am using Cyfe to easily set up everything under one dashboard. All of the above tools can be used in place of bookmarks. But sometimes you just want that quick access, and so I wouldn’t say bookmarks are obsolete just yet. Maybe they never will be. Using a content collection app is a good way to reduce your bookmarks. From there, you can start organize them for efficient use. Start by going through your list and beginning to delete the ones you have not visited recently, or don’t need. You know that most of your links will fall into that category. If you forgot it was there, you don’t need it. Next, create a series of folders on your toolbar. Each one should represent an overall category. Inside, make subcategories to further break down your links. For example, you could create Health, with the subcategories Fitness, Diet, Skin Care. Every time you save a bookmark, make sure it goes into the right folder and sub-folder. The most important tip is to ask yourself in the future if you need any of the bookmarks you are collecting. Is it something you will genuinely look at again? Could it be better suited in a content aggregator, like Pinterest or Evernote? This is an issue that I am affects everyone at regular intervals of the day. There are several options at your disposal. LeechBlock – Firefox users can use Leechblock, a simple add-on that allows you to create multiple times that certain websites are allowed and when they are not. You can also select an option to lock down websites after a certain time limit has been spent there. So say you don’t want to spend more than fifteen minutes a day on Facebook, LeechBlock can make that happen. 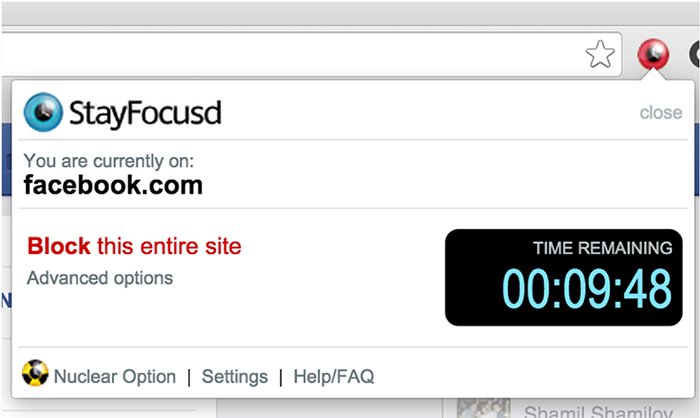 StayFocusd – Very similar to LeechBlock, StayFocusd is for Chrome users. But it has a specific feature that makes it an excellent choice: a nuclear option. Select it to completely block all banned sites on your list for hours at a time, so you can work. Turn on a feature that keeps you from accessing settings during that time so it can’t be turned off. Cold Turkey – One of the more popular and newer tools, Cold Turkey will block applications and browsers across the whole computer in order to allow you to focus. You select the websites you are most likely to visit, and when they should be blocked. That includes manual blocks and scheduled ones. Create different blocks for different times. FocusMe– Another multi-browser lock-down tool, there is an additional tool that makes this a great option. It provides a reminder system to taking breaks, something that many of us forget to do. Stay healthier by getting away from your computer, while remaining well focused and getting through your work. FocalFilter – A quick and dirty little tool that lets you put in the websites to block, how long to block them, and nothing else. If even customizing block apps is too much of a distraction, this could be the one for you. Organized web browsing is totally possible. But it can often be more than just a matter of breaking habits, and you may need a little help. Get it from the tools and tips above, and stop wasting so much time and energy. Let’s get productive!